I think from looking at my blog, you can probably gather that I am obsessed with makeup. I have been for years and years and now I have a makeup collection that Sephora would be proud of. As much as I love it though I know that it is a little excessive. On the daily I probably use about 20 different products which I know is all kinds of crazy, but when you actually think about what you use I bet I’m not the only one really high up on the scale. So, when I saw this kind of post floating around in the blogging world I thought straight away that I had to give it a go. Not only am I going to tell you what products I would use for my 5 products only face I am actually going to do it and go to work like it. I would share a picture of me with only the 5 products on but I am pretty sure that I would look a little ratchet all day! I put off trying this foundation for months because I didn’t think that it would work with my oily skin type. To be quick about it, it did work and now I love it. It doesn’t add oil to the skin it just makes your skin glow and look really nice and healthy. I know that I can wear this foundation for a full day at work and then even go out in the evening and it will look just as good 12 hours later as it does first thing in the morning when I first put it on. When I sit and look at my drawer full of foundations this is always the one that I end up using! I have a drawer full of concealers, it was only the other day that I did a post about my top concealers and I think it is only right that I use my most used concealer on my 5-product face. The Urban Decay concealer is like nothing that I have used before. It is really creamy and glides on the skin so smoothly. It covers everything and makes the skin look so flawless and perfected. I am a lover of the Tarte Shape Tape concealer, but this to me is just really nice and lightweight and doesn’t settle into any fine lines which is what I need in a concealer. I could not possibly go a day without using mascara. When I don’t have mascara on I feel like I can’t see my eyes and I just look strange. I usually wear mascara and lashes so if I went from that to nothing I would end up looking like an alien. I do love my Maybelline Sensational mascara but nothing compares to my YSL Shocking Mascara. It makes the lashes look really long and thick and best of all it is absolutely jet black. I am still on the hunt for a mascara that I love half as much as I do this one, but at the minute the YSL Shocking Mascara is right at the top. I love the Anastasia Brow Pomade so much that I can barely express my feelings for it. I fill in sparse areas of my eyebrows where over plucking in my youth has caused me to have bald areas. 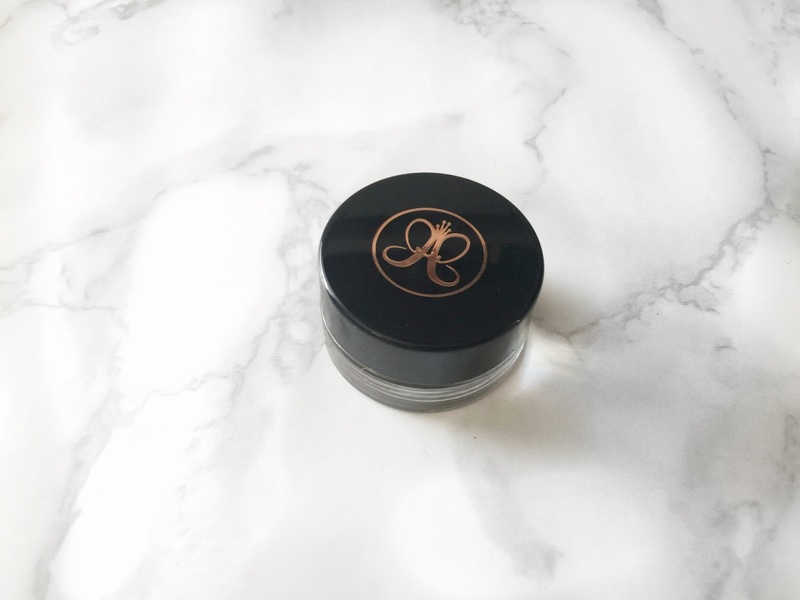 I have tried loads of things over the years in regards to pencils and powders but nothing has been pigmented enough to cover up until this Anastasia Brow Pomade. Because of how pigmented it is, when you use small brush strokes it just mimics the look of hairs and helps you to have really thick and full brows. I always choose bronzer over blush. I just think that a good bronzer makes you look nice and healthy even when realistically you are feeling a little foul. I have been obsessed with this bronzer since I first bought it. I use it day in and day out so I would definitely have to use it, even on the days where I barely wear any makeup. The good thing about this bronzer is that it is just a nice and natural colour, it genuinely looks like you have been sunning yourself for a couple of hours because it has a nice sheen to it that looks really natural. The only thing with these products is that it isn’t set with powder and that to me is a nightmare, but I guess blotting sheets and tissue paper would have to be my best friend to try and keep my oily skin under some kind of control! Be sure to leave me a comment below and let me know what you would use for your 5-product face. I will also leave links down below to all of the products that I have mentioned in case you want to check them out! I am with you there, that is why I found it so hard! To me, the Giorgio Armani is just one of them foundations that everybody should try, I love the stuff! Awesome guidelines. I hope that the products that you have shared here, will be a perfect choice for me to maintain my skin. This YSL mascara sounds amazing! And I love the idea behind this post, I may have to do something similar. I love the YSL Shocking Mascara, it is one of them products that I cannot be without!